B : Catch Brigitte on CreativeLive! On Saturday, August 23rd, Brigitte is joining Tara Gentile on CreativeLive to teach a segment on connecting with the influencers that will take your message to the big time. As part of Tara’s 3-day program, I’ll be helping you redefine networking and giving you a concrete action plan for making the connections that will drive more customers to your next launch. You’ll learn the secret to connecting that PR mavens know (and you can steal). And the best part is it’s free to tune in! 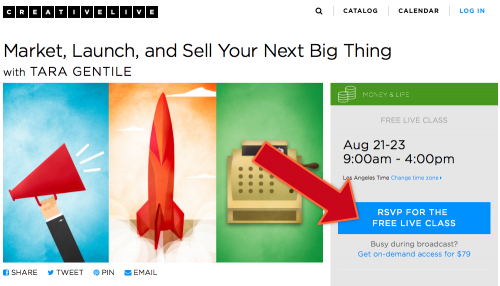 Come on over to CreativeLive and RSVP for Market, Launch, and Sell Your Next Big Thing. When you do RSVP, you’ll immediately get access to bonus video content on finding your next big thing, avoiding a flopped launch and turning excitement into dollars. The program kicks off this Thursday at 9 a.m. Pacific (and my segment is Saturday around 12:45 Pacific). Hope you’ll join us!